Adhesional small bowel obstruction (SBO) occurs in 14–17 % of patients within 2 years of open colorectal or general surgery. The aim of this pooled analysis is to compare the safety and efficacy of laparoscopic versus open treatment of SBO. An electronic search of Embase, Medline, Web of Science, and Cochrane databases was performed. Weighted mean differences (WMDs) were calculated for the effect size of laparoscopic surgery on continuous variables, and pooled odds ratios (PORs) were calculated for discrete variables. There were eleven non-randomized comparative studies included this review. Laparoscopic surgery was associated with a significant reduction in mortality (POR = 0.31; 95 % CI 0.16–0.61; P = 0.0008), overall morbidity (POR = 0.34; 95 % CI 0.27–0.78; P < 0.0001), pneumonia (POR = 0.31; 95 % CI 0.20–0.49; P < 0.0001), wound infection (POR = 0.29; 95 % CI 0.12–0.70; P = 0.005), and length of hospital stay (WMD = −7.11; 95 % CI −8.47 to −5.75; P < 0.0001). The rates of bowel injury and reoperation were not significantly different between the two groups. Operative time was significantly longer in the laparoscopic group (WMD = 72.31; 95 % CI 60.96–83.67; P < 0.0001). 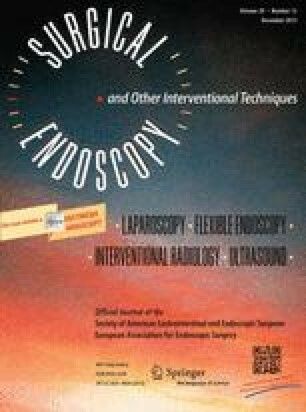 Laparoscopic surgery for treatment of adhesional SBO improves clinical outcomes and can be performed safely in selected cases with similar rates of bowel injury and reoperation to open surgery. Large scale randomized controlled trials are needed to validate the findings of this pooled analysis of non-randomized data. Mr Tom Wiggins, Mr Sheraz R. Markar, and Mr Adrian Harris have no conflicts of interest or financial ties to disclose.